God’s pedagogy is unsettling, shocking and often becomes a stumbling block to the faint-hearted, small-minded and cynical. Though it is true that He knocks like a beggar at the door of our hearts, waiting to be admitted, pursuing us like the hound of heaven (to use the image of Francis Thompson), it is also true that when we finally start seeking Him, He appears to go into hiding. One can observe this pedagogy in the apparitions of the Blessed Mother in Lourdes, which started on February 11th, 1858. She could have made it easy for people by giving her name and working miracles immediately. Instead, the Virgin waited until the 16th of the 18 apparitions to use a term Bernadette didn’t even understand: “I am the Immaculate Conception”, which – of course – would confirm that the latter couldn’t have made this up. In the meantime, Mary said little, often nothing and waited until the 9th apparition to ask for penance (during the third she simply asks Bernadette with the courtesy of a queen to do her the honor to visit her for 15 days, while prophesying that she would not be happy in this life, but in the next). Twice she does not appear at all (poor Bernadette!). Then the Blessed Virgin shocked the crowds during the 9th apparition by asking this little peasant girl of the Pyrenees to drink at the fountain, wash herself and eat grass. Bernadette had to dig a hole in the earth and with great difficulty managed to ingest some of the mud and wash herself with it. Many people thought she was crazy. 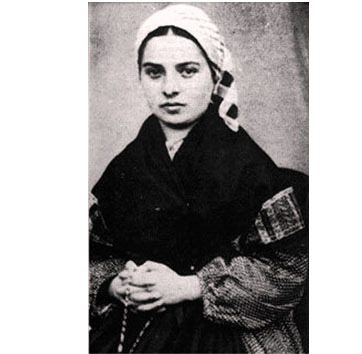 But she never wavered and was thereby emulating the “white Lady”, as Bernadette called her, who had never faltered in her faith in God, even in the face of Joseph’s initial lack of understanding at her pregnancy or having to witness her son die on the cross. Bernadette’s simplicity and humility testify to the truth of her statements. This together with the help of the Holy Spirit inspired her answers that silenced her critics even if it didn’t convince them. Asked why she ate grass like a beast, she answered that her interlocutors ate salad after all. Facing those who remained unconvinced, she answered that she was not required to persuade them, but only to relate the message. Heaven may test us in our faith, but it does give us ample opportunity to believe if we are willing to wait and see. The place where Bernadette dug up mud became an unending source of water that would heal many thousands even if only 70 miracles have been officially recognized by the Church who prefers to err on the side of prudence. Yes, there are still things in Lourdes that are off-putting, one of them being its commercial aspect with the many shops selling kitsch (though I recommend going to the place selling the wonderful artwork of the little sisters of Bethlehem). But neither Mary nor this young girl asked for that. There will always be enough sinfulness in the Church on earth to shock and scandalize, but her holiness – if one has the patience and humility to see – is infinite. Each place of apparition has its own charism. In Fatima one feels the urgency of converting given the signs of the times, in Medjugorje (whether you believe in it or not) a tremendous peace and in Lourdes, it is the misery of the world trailing in front of the grotto, searching for help. Not everybody gets healed, but many receive graces that allow them to carry their cross with greater peace and courage. There will always be writers like Emile Zola who scoff at believers and who will not only remain unconvinced despite witnessing miracles, but even lie about them (he claimed that Marie Lebranchu and Marie Lemarchand had not been instantaneously healed from tuberculosis, and had died after their pilgrimage). But it was a Jewish writer, namely Franz Werfel, who composed a masterpiece on Bernadette and set a literary monument to the Blessed Mother (The Song of Bernadette). Our Lady Untier of knots, please undo the knots of our illnesses, our lack of belief, small-mindedness and cynicism on this feast-day so that we may allow God to transform our hearts. Wonderful article .It is true the special charisum of Lourdes is the sharing of the misery of man the need to pray for others to the point to forget yourself. It was a real lesson to see very sick people praying for others and leaving with peace and joy.